Marxists all over India are angry, fired up and demanding attention because statues of their ideologist Lenin were pulled down in one corner of the country. The razing of the statues in Tripura resulted in tensions quickly escalating all over India. However, the story of West Bengal former chief minister Jyoti Basu and his ideology stand out at this juncture. The most famous Indian Marxist had, many years ago, warned his partymen and followers against building his statues or preserving his chair, and even observing his birthday. 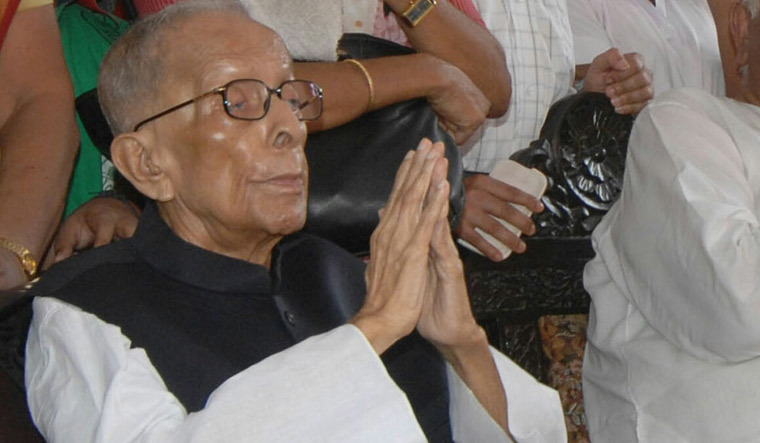 Almost seventeen years ago, shortly after quitting as the chief minister of West Bengal, Jyoti Basu said he had warned the party against worshiping people, including him. “History has no reason to remember an individual and it does not,” said Basu in reply to another question in the same interview. The icon did not want to leave his mark. And, that’s what communists do. Basu's statements gain more significance as it comes to light that Tripura government had spent Rs 4.5 lakh and Rs 3 lakh from public money for the two statues. But soon after Basu's passing away in 2010, the Left Front government renamed the Eastern Metropolitan Bypass road to Jyoti Basu Sarani. The proposal was mooted and finalised by the then minister Gautam Deb, who was once a close aide of Basu. Currently, Deb is a central committee member. The reason behind naming the street was clear. On both sides of the E.M. Bypass two satellite townships were created—Rajarhat and Salt Lake. While Basu finished Salt Lake, he started Rajarhat which was sped up by his successor Buddhadeb Bhattacharjee, but is yet to be completed. However, after winning the historic mandate in 2011, Mamata Banerjee reversed the previous government's decision to name it after Basu. The road is currently called Biswa Bangla Sarani, with the name given by the chief minister herself. Deb protested, but his party largely remained silent. A section of leaders wanted a movement against Banerjee's decision. But some veteran leaders resisted such attempts saying even Basu would not have accepted it. After the fall of Lenin’s statue, Banerjee said she would not have approved of such acts by her own partymen. “We could have broken or uprooted Lenin’s statue, but that’s not our education and learning. They (BJP) cannot pull down Lenin, Marx, Tagore, Vivekananda or Netaji,” said Banerjee. The CPI(M) led a massive rally in Kolkata protesting the Tripura episode.